In skillet, heat the olive oil over medium high heat and sauté the onion until translucent. 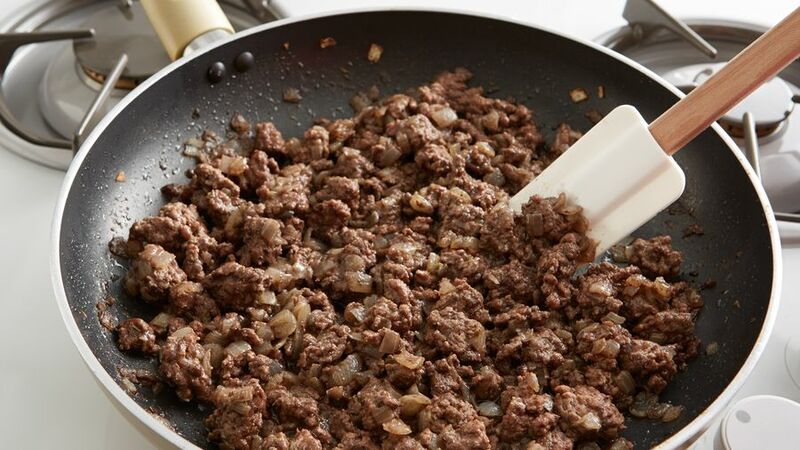 Stir in ground beef, garlic powder, oregano and black sauce. Cook it until the meat is well done (no longer pink), for about 20 minutes. Season with salt and pepper; the meat should be saucy. For nachos: place a bed of totopos or tortilla chips over a heat-resistant glass container. Pour meat mixture over chips and add a layer of beans. Sprinkle both cheeses over it. If desired, place a second layer of totopos, beans and cheese until ingredients are finish; sprinkle tomato on top. Bake for about 15 minutes or until cheese melts. Garnish with a teaspoon of cream and several cilantro sprigs. Serve hot. Use your favorite beans: kidney, pinto, white, etc. You can add red peppers and corn to the meat mix to make it more colorful. To make them an even better option, use ground chicken or turkey. Ground beef is one of those ingredients that is always my lifesaver. I use it in many of my recipes, to stuff empanadas or in picadillos, Costa Rican stews made with different vegetables. 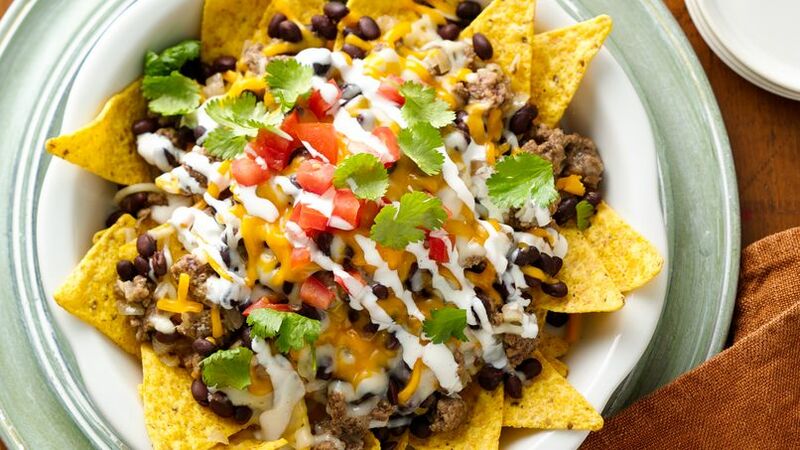 The other day I used ground beef for some nachos and my kids loved it. I added black beans, tomato and cheese to give them more consistency and to make them a complete meal, not just an appetizer. The secret to my nachos is to season the meat and cook it well, while leaving it succulent. This way, when you put it in the oven to melt the cheese, the meat won’t dry out, and the result is a tender, but crunchy dish. These nachos also offer a great way to use other leftovers, because you can really add many other ingredients like corn, rice, olives, green beans, red peppers and hot chilies, if you want to make them spicy. If you want a better option, use ground chicken or turkey, it’s delicious! Also, use the baked totopos sold at various locations, so they don’t turn out too greasy. There’s a restaurant near my home where I buy totopos or tortilla chips. Not only are they more inexpensive than those sold at the grocery store, but they’re freshly made every day and, since they’re baked, they’re fat free. I suggest you buy the totopos at your favorite restaurant. 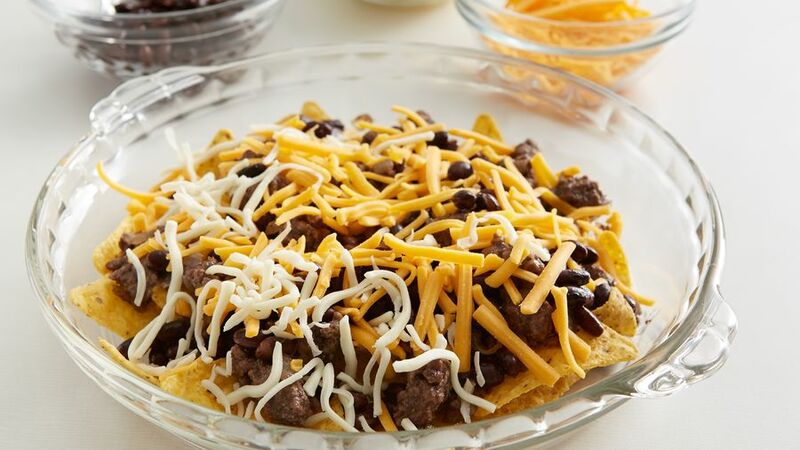 Get inspired and make my beef nachos recipe for your next get-together. You’re going to like them!